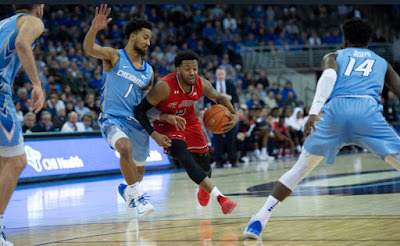 St. John's point guard Shamorie Ponds averaged 24.0 points per game in a 1-1 week for his team, and on Monday, he was named to the Big East Weekly Honor Roll for the seventh time this season. Ponds scored 28 points in a win over Marquette on the road last Tuesday, and 20 points in a loss to Providence at Madison Square Garden on Saturday afternoon. The junior guard, who also earned an honor roll spot last Monday, also averaged 6.5 rebounds and 2.5 assists in the two games. The Brooklyn native, a two-time Big East Player of the Week this season, shot 44.4 percent (16-of-36) from the floor and 93.8 percent from the free throw line (15-of-16) in those two outings. On Tuesday night at Marquette, the Red Storm completed its season sweep of the nationally ranked Golden Eagles behind a stellar performance from Ponds. In a full 40 minutes of action, the southpaw posted 28 points on 9-of-19 shooting from the field in addition to sinking all nine of his tries from the charity stripe. Ponds scored the Johnnies’ final 10 points of the evening and 15 of their last 16 overall, including the game-winning layup with 16 seconds to play. Ponds also corralled seven rebounds and swiped two steals, moving into a tie for fifth place on the St. John’s career thefts list with Sir’Dominic Pointer (200). On Saturday, Ponds provided a bright spot in the team’s 70-56 loss to Providence, netting 20 points and grabbing six boards. Ponds has eclipsed the 20-point plateau in 15 of his 23 appearances this season, including each of his last nine Big East outings. On the year, he ranks third in the Big East in scoring at 20.7 points per game, including a 23.1 point per outing average in league games, the latter of which is good enough for second in the conference behind Markus Howard (25.3 ppg). In addition to his scoring prowess, Ponds also leads the league in assists (5.3 apg) and steals (2.7 spg). Ponds and the Red Storm return to action Tuesday night at 8:30 p.m. against Butler at Carnesecca Arena.